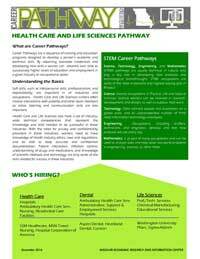 Learn more about Healthcare careers in Missouri: who’s hiring, occupational profiles, and career pathways. Plus a feature profile on Pharmacy Technicians, found on the last page. Pharmacy Technicians or “Pharm-techs” play a vital role in both local pharmacy operations and the healthcare industry. OTC’s Center for Workforce Development offers two different options to obtain certification status before changes to regulations scheduled for 2020. These projected changes will significantly increase the number of accredited coursework hours required by the Pharmacy Technician Certification Board (PTCB) to prepare for the Pharmacy Technician Certification Exam (PTCE). By obtaining certification prior to upcoming regulation changes, you will be “grandfathered” under certain requirements. Accelerated Pharmacy Technician: If you are already working in a pharmacy and meet course requirements, you may take one of our 10-day courses. Each course focuses on a particular industry environment, either hospital or retail. Certified Pharmacy Technician: If you are new to the field or wanting to get started as a pharmacy technician, give this course a look. Currently offered course descriptions and registration information are available from the links below. If you do not see the course you are looking for, please check again next semester.